"Whosoever dies wearing this Scapular Shall not suffer eternal fire!" No matter how extraordinary the promise made by Our Blessed Mother may appear, She made it and She will keep it. At the word of Her FIAT, She conceived by the Holy Ghost and the Incarnate Word became Man. If Almighty God comes down upon our Altars: Body, Blood, Soul and Divinity, in obedience to the words of the priest every day at Holy Mass, would He refuse His own Mother the grace She asks for Her children? The Immaculate Heart of Mary." True devotion to Mary consists in three things: Veneration, Confidence and Love. Without saying to Mary we venerate Her, love Her and trust in Her motherly protection, we show Her all these things every moment of the day by simply wearing Her Brown Scapular. THE SCAPULAR IS A PRAYER! Mary’s Motherhood is not limited to Catholics; it extends to ALL MEN. 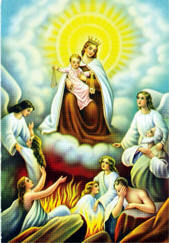 Many miracles of conversion have been obtained through the devout wearing of the Scapular. The Scapular is a great missionary Sacramental. After the Rosary, the Scapular is the most highly indulgenced Sacramental in the Church. Become an apostle of the Brown Scapular! Today, the terrible demise that many overlook, is the horrible devastation of our Catholic families, who recklessly choose to ignore Our Blessed Mother’s requests. What a deplorable loss of Sanctifying Grace for mankind! We are at war. Satan and the world battle for our souls. There is but one step between us and death. Make haste to take refuge in the Heart of Mary. to excite pious thoughts and increase devotion. Through these movements of the heart, venial sin is remitted and grace imparted. The possession of grace is the Foundation of Peace. Let everyone wear the Scapular! The first Scapular worn should be blessed by a priest and imposed by him (if possible). Any priest may bless and enroll in the Confraternity. After having received the initial blessed Scapular from a priest, no other Scapular need be blessed before wearing. The blessing and imposition are attached to the wearer for life. The Scapular is ‘Mary’s Mantle’ made of wool and MUST be worn over the shoulders so that one piece falls in front and the other in the back. Each time the Scapular is kissed with devotion, 500 days indulgence is granted to those in the state of grace. The Scapular Medal was created only for those who would suffer grave inconvenience in wearing the cloth and the indul-gence of 500 days does NOT apply to the Medal. To obtain the graces and promise of the Scapular, it must be worn constantly. It should be worn, day and night, in sickness and in health. Then the Scapular is worn out, being a sacred object, it should not be thrown in the regular garbage but should be burned or buried. Observance of chastity according to one’s state in life. Daily recitation of the Little Office of Our Blessed Mother. For those in the Living Rosary, special dispensation has been granted and our Daily DECADE may be substituted for the Little Office. Scapular wearers share in the daily prayers of the Carmelite Order and the worldwide good works of over two hundred million members of the Scapular Confraternity. Man cannot be saved without prayer. Only one thing can release the graces necessary to bring about world peace and that is prayer. The Scapular is the Promise of Mary’s prayer. By wearing the Scapular, we offer the perpetual prayer that everything we do is done in God’s Eyes through Mary. At the same time, we become apostles of His Mother because all that He requires to save the world is to make our daily actions a prayer in union with Her. 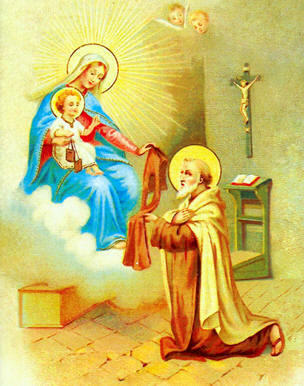 The Brown Scapular is the masterpiece of the love of the Heart of Mary. An attack on the Scapular is an attack on the Church and the Mother of God. Let us defend it and explain its value to all! It is our sign of belonging to the universal family of Her Immaculate Heart. Mary, O my Mother, I am Thine! Sprinkle the Scapular with Holy Water. “Receive this blessed habit and ask the Most Holy Virgin that, by Her merits, it may be worn without stain of sin: that She may guard thee from all evil and bring thee to life everlasting. Amen. y the power granted to me, I admit thee to the participation of all the spiritual works performed, with the merciful help of Jesus Christ, by the Religious of Mount Carmel; in the Name of the Father and of the Son and of the Holy Ghost. Amen. Sprinkle the person with Holy Water. This entry was posted on Thursday, January 19th, 2012 at 4:04 pm and is filed under NewsFlash, Saint Philomena. You can follow any responses to this entry through the RSS 2.0 feed. Both comments and pings are currently closed.